This week we will check out a dinosaur that is unfortunately, despite its popularity, is very poorly understood by the general public. Make way for Dilophosaurus wetherilli! Dilophosaurus was a meat-eating dinosaur that lived in what is now Arizona, in western North America, during the early Jurassic Period, 193 million years ago. Trace fossils, like footprints and even a belly imprint of a dinosaur sitting down from the east coast of the United States have also been associated with Dilophosaurus. (or a dinosaur very similar to Dilophosaurus from what we can tell) The largest specimen measures about twenty three feet long from snout to tail. The genus name translates to "Two Crested Lizard/Reptile" in reference to the fact that this dinosaur had two, parallel, half-disc-shaped crests on the top of its snout. The species name is in honor of John Wetherill, a Navajo councilor from near where Dilophosaurus' bones were first found. Dilophosaurus wetherilli temporarily being startled by a Protosuchus. The inner monologue here is something like "GAH!...OH, YUM!" 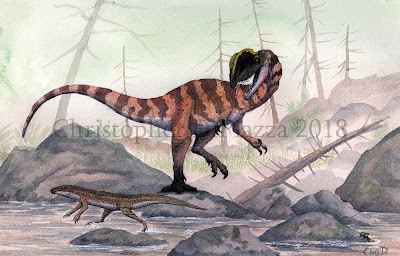 Dilophosaurus was the largest known member of the coelophysoid family of theropod dinosaurs. Coelophysoids were meat-eating dinosaurs that were highly successful during the late Triassic and early Jurassic periods. They all were relatively lightly built, had low, narrow snouts, long necks, tails, and legs, hollow bones, and three clawed fingers and one vestigial finger on each hand. Other examples of coelophysoids are Coelophysis and Liliensternus. Dilophosaurus' skull is striking. The first thing you notice are those two crests that grew from the top of the snout. These crests were made of very thin bone, and probably were too delicate to be used as any sort of weaponry in life. That being said, they were most likely a kind of display adaptation within the species. Unfortunately we don't have a large enough pool of complete Dilophosurus skulls to say if they were present in both sexes or not, but they are present in all the complete adult Dilophosaurus skulls on the fossil record so far. Partially reconstructed Dilophosaurus skull mount on display at the American Museum of Natural History in New York. Dilophosaurus had a long, slender snout with long, curved teeth that were compressed laterally. They appear to have been great at slashing and puncturing, but not ideal for crushing or taking any sort of hard impact. This doesn't seem to have been too much of an issue for Dilophosaurus when you think about its known environment, however. It was the largest known predator in its environment. All its prey consisted of much smaller animals, including small, early crocodilians, amphibians, mammals, and sauropodomorph dinosaurs that were about half Dilophosaurus' size. So Dilophosaurus wouldn't have needed to have had bone-crushing jaws to tackle large prey, because everything it would have been hunting that we know of could have been overpowered with relatively little effort once caught. In fact, the shape of Dilophosaurus' upper jaw has a deep notch just before the nostril. This jaw has convergent evolved in other dinosaurs, like spinosaurs, which we know were eating fish in life. There is a strong possibility that Dilophosaurus was a fisher as well. Dilophosaurus holotype specimen. Photo by of Eduard Sola. One specimen of Dilophosaurus shows multiple injuries that had healed in life. These include fractures, bony tumors, and even a deformed finger on the right hand. All of these injuries were concentrated on the arms, hands, and shoulders. This supports the idea that Dilophosaurus may have used its arms and front claws the most for fighting or subduing prey. Or maybe it just took a nasty fall or ran into a tree? Regardless, the point is Dilophosaurus was capable of taking a beating and shaking it off to survive years later! Oh, and one more thing. Dilophosaurus was one of the main dinosaurs in the original Jurassic Park. Its being featured in this movie was sort of a double-edged sword. On the one hand, an obscure dinosaur, that not many people were familiar with outside the paleontology community, suddenly became insanely popular amongst the general public, and is still highly regarded to this day. On the other hand, it was portrayed horribly inaccurately, sporting a retractable frill, similar to that of a modern Frilled Lizard, and had the ability to spit venom. Neither of these features are supported by any fossil evidence whatsoever and were completely made up in the name of showbiz. Milner, A. R. C.; Harris, J. D.; Lockley, M. G.; Kirkland, J. I.; Matthews, N. A.; Harpending, H. (2009). "Bird-like anatomy, posture, and behavior revealed by an Early Jurassic theropod dinosaur resting trace". PLOS One. 4 (3): e4591. Rothschild, B.; Tanke, D. H.; Ford, T. L. (2001). "Theropod stress fractures and tendon avulsions as a clue to activity". In Tanke, D. H.; Carpenter, K. Mesozoic Vertebrate Life. Bloomington: Indiana University Press. pp. 331–336. Senter, P.; Juengst, S. L.; Heymann, D. (2016). "Record-breaking pain: the largest number and variety of forelimb bone maladies in a theropod dinosaur". PLOS One. Welles, S. P. (1984). "Dilophosaurus wetherilli (Dinosauria, Theropoda), osteology and comparisons". Palaeontographica Abteilung A. 185: 85–180. The paints that I use are either Grumbacher or Daler-Rowney depending on the color. (They used to all be Daler Rowney though) The paper I usually use is from a company called Arches. (cold press watercolor paper) However I recently am also using paper from a big stack a friend donated to me that came wrapped in brown paper with no label or company name on it.